Waiting for the first tomato is almost like waiting for Christmas. Well, not quite, because we are never sure exactly when the first tomato will ripen and be ready to eat. I follow certain guidelines on what qualifies as the first tomato here at May Dreams Gardens. First, it can't be a cherry tomato. Those are like garden candy, and technically, I've had a few cherry tomatoes already, from a variety called 'Micro Tom', which is a very small container grown variety. Second, it can't ripen off the vine in the windowsill. I know this guideline will cause some controversy, as many gardeners pick their tomatoes a few days before the tomatoes are really ripe to make sure they get them before some bird or rabbit does. Maybe it's just me, but I like to have a least one good tomato, vine-ripened, warmed by the sun, that I can pick and eat without leaving the garden. Then I am ready for a deluge of tomatoes of all kinds, shapes, and sizes. I follow a few simple practices to ensure that my tomato plants stay healthy so I have a chance at having too many tomatoes, weather permitting. Try to give tomato plants an even and consistent amount of water. This is not always easy when there is a lot of rain, but, well, do your best. Pinch off the suckers so the plant spends its energy on the tomatoes and not on a lot of foliage growth. Here's a sucker on this plant ready to be pinched out. 'Suckering' is especially helpful on the indeterminate varieties of tomatoes. These varieties continue to grow taller as the season progresses, where as the determinate varieties form more of a small bush. If a sucker gets to be too big, use your pruners to cut it off. Go ahead, it won't hurt the tomato plant. I've written before about staking tomatoes, not caging them, so I won't lecture on that further. Trim off any brown or diseased looking foliage. Diseased foliage should go in the trash, not the compost bin. 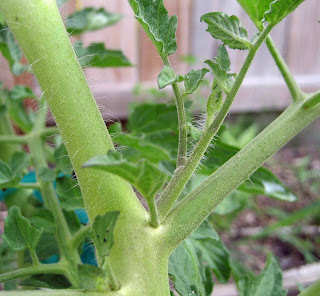 Look for tomato hornworms or the damage they cause. Those hornworms are like the Grinch who (tried) to steal Christmas. They will try to rob you of your tomato harvest, and no, they want have a change of heart the morning you find the first ripe tomato. They'll just eat it if they find it. 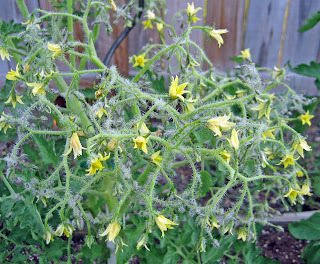 This morning, I found evidence that a tomato hornworm was on this tomato plant, a 'Yellow Mortgage Lifter'. Even if I hadn't noticed the foliage eaten off, I would have noticed the hornworm's 'droppings' which are big enough to be noticeable. It takes a few minutes and some patience to find the hornworm because they are good at hiding. I finally found this one. Once you find the hornworm, you must remove it and destroy it. I spent some time this morning pinching out suckers, tying up the tomatoes to the stakes that were set in the ground before I planted the tomatoes, finding and destroying a hornworm and then looking over the tomatoes to see if I can figure out which one will be the first tomato, the ONE, the chosen, deserving of a ritual of some kind to commerate its ripening. Will it be these one of these 'Early Girl' tomatoes? I don't think so. The earliest I've ever picked a good tomato was July 19th, back in 2001, and this won't beat that so I might disqualify it for not living up to the 'early' part of its name. Maybe it will be this 'German Johnson'. I hope so, because this one reminds me of my paternal grandmother. Or maybe it will be this 'German Red Strawberry' variety? This is borderline big enough for consideration. You want your offical first tomato to be a nice big tomato and this one might not be quite big enough. And will there be a tomato contest this year? Last year was a disappointing year for tomato growing around here so I started a ritual for the smallest tomato and it turned into a contest of sorts, which Chigiy won with a 'Red Currant' tomato. I planted some of those these year, just in case I want to repeat that ritual but I don't think that will be the contest. I'll come up with something else for a tomato contest, something that I can win, or think I can win. Or maybe I'll get a real company to offer up a real prize, and then I'll be a judge. Hear that companies out there? Do you want to sponsor my tomato contest and offer up a free prize to the winner? Just send me an email to let me know. In the meantime, how are everyone else's tomatoes doing this summer? I dream about the first tomato of the season, well before I even start my seeds. It's a sickness for sure. We've been enjoying tomatoes for about a month, and they're just kicking into high gear now. Every year I say I will do better with staking/caging, but so far I qualify as lazy gardener(d). I have picked the first red tomato...early for me but all the rest are green, green, green! Well, one little 'Juliette' is ripening now. Oh, and a couple of 'Sungold'. That first picture has a bazillion flowers! What kind is that one? Sorry to say I am a cager. Staking has just never worked to well for me as it is in the details. Some of my best friends are stakers! I've only had a couple of cherry ones so far. I'm thinking my first real tomato might be a black krim but we shall see. By the way, that worm thing is freakin gross, carol! Last year, I fed hornworms to the ducks that frequent my backyard. My first almost-ripened tomato was eaten by a nutria last night. Nutrias are too big and nasty to feed to the ducks. When I capture it, I will have animal control haul it off to death row. Like you I've snacked on a few cherry tomatoes in the garden (but just today). I am growing Bonnie Original, Celebrity, Park's Whopper, Early Girl, and Brandywine Pink. The only thing I know for sure is that the Brandywine Pink will not supply the first tomato. I fear I haven't been watering enough in the very dry conditions we've been experiencing, but hey I'm kind of lazy. Which explains why I cage and then panic when the plants collapse and then stake. Katie, I think it takes some planning to stake your tomatoes properly, not necessarily a laziness thing. Layanee, I forgive you for caging. That flower is amazing, isn't it? That's a variety I'm trying call Reisentraube. I am curious what the tomatoes will be like! Gina, You think that hornworm is gross on the plant... try squishing one! Jungleswife, I'll admit I've never heard of a nutria, so I looked it up. That's some rodent! Heather's Garden, Yes, watering is key, as is good support for the plants themselves. Yesteday I saw the first teeny, tiny green pea of a tomato, one each on one of the Brandywines and Thessalonikis. Let me tell you, as a novice gardener, I was ecstatic! We've been eating tomatoes for awhile, but we cheated and started with plants rather than seeds. I need a demonstration on trimming up tomato plants. Would you please come over and demonstrate? I like your method for dealing with tomato worms! I hate those buggers almost as much as Japanese beetles! Some great advice here, Carol; I always use tomato cages, but I'll have to go back to read your suggestions about why staking is better. My tomatoes were looking good, but in the last week several of them have developed some yellow and even a few brown leaves. I thought it might be because we had too much rain at one time. I hope I don't lose any plants. My tomatoes are doing much better this year and soon I will be able to pick the first ripe one of the vine. 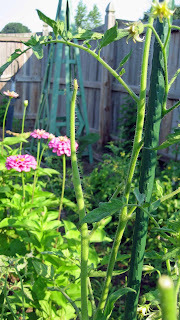 Like you I put in the stake (well, I use spirals)first and the tomato plant afterwards. It makes sense to do it like that as you won't damage the roots. Ugh to that hornworm, I'm very glad we don't have them here. 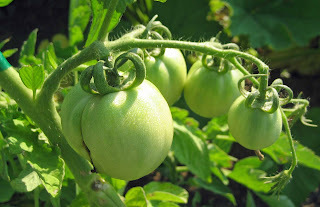 I hope you do get to have a vine-ripened tomato in Indiana, Carol - but if you left them on the vine in my garden you'd still be waiting for the first tomato....they are eaten, disappear or have holes poked in them as soon as any blush of color appears. My bet's on that German Johnson - what a great looking tomato! 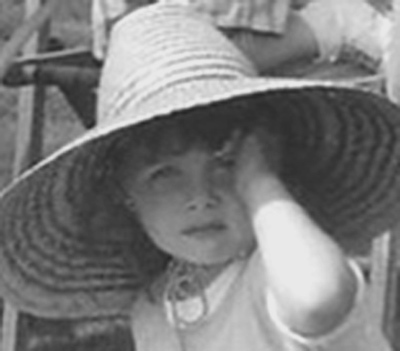 I can't help remembering my oldest daughter when she began to lean about humor and jokes. "Ask me if I'm a tomato"
She didn't have an answer but we laughed anyway. We still do no matter who tells that old family 'joke'. 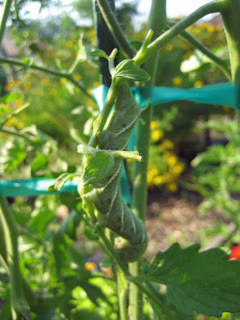 How about the most creative way of dealing with tomato hornworms. I'd like to see some videos of hornworm dances, favorite recipes, unusual use of common household utensils and before and after pics. I am putting some money down that you will win and the squirrels, bunnies, tomato hornworms and/or birds will lose in the race to be the first to bite into the vine ripened tomato! Cherry tomatoes are like candy and meant to be eaten as one strolls around the garden. Don't you just love how your hands smell after pinching back tomatoes? 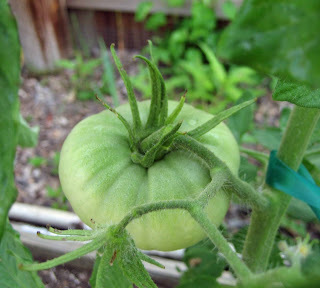 My winter-sown plants are doing great and I'm eagerly awaiting ripe maters! Sorry, Carol, I got sidetracked. 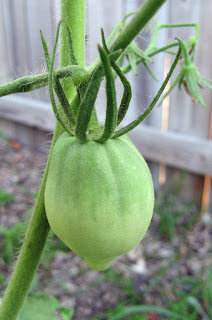 Fabulous post on tomato growing. I leave some suckers on here because it gets so hot that the tomatoes get sun scald. Also, the reason I don't stake my tomatoes as I plant is that I'm lazy. Yes, lazy. I've got so many to plant, and I just hurry and get them in the ground. That time of year is very busy. I finished staking yesterday. Also, if I get lots of rain, I work egg shells into the soil for calcium to prevent blossom end rot, a problem here some years. We didn't plant tomatoes this year. I regret it, but I nearly lost my mind last year trying to keep them happy and healthy and then the raccoons devoured them all. I needed this year off to remember how it's still worth it! Thanks for the great tips. Hi Carol, your rules are broken here about the staking, we must cage due to the no sucker picking. Suckering is for those with a short growing season, trying to get ripe fruit before the cold sets in. That is not a problem here, but like Dee, we need to shade the fruit. Also, you get way more tomatoes from every branch, that's why the cages are necessary. These plants become monsters. We have found one hornworm and tossed him as far as possible into the woods. The tomatoes get picked as soon as they begin to turn or the birds poke holes in them, not allowed here. We have golden gem and red grape little tomatoes that we are starting to leave on the vines since we can't keep up with the picking. But the prize we are waiting for is the black krims. There are three huge ones on the windowsill. These are new to us this year and we have heard raves about the taste. No BLT for these, they must be tasted straight up. We will announce our findings. Rowena, that first tomato is exciting no matter how long you've gardened. Sherry at the Zoo, I will come over and show you how to sucker tomatoes, but first you have to promise to stop caging your tomatoes! Rose, I don't think you'll lose any plants, just trim off those brown leaves, and watch for tomato hornworms! Yolanda Elizabet, No tomato hornworms? You are lucky. Annie in Austin, My monies on that 'German Johnson', too! Wiseacre, About that contest... ummm... thanks for the suggestion but I'll pass. I don't want to see all kinds of hornworm guts pictured on blogs! Gail, Thanks, I appreciate the confidence! The Garden Faerie, I do like the smell of tomato foliage! Dee/Red Dirt Rambling, Don't tell anyone but I end up leaving some suckers on my tomato plants, too, because every once in a while, one will just get too big even for me to cut it off. Ann, Your tomatoes next year will taste the much better! Frances, You do have a longer grower season than I do, I look forward to hearing your report on 'Black Krim'. Maybe I'll grow that one next year. We have had a bit of a tiff here at our household over eating the first tomato. I refused to share because my husband wanted to chop it up in a salad. What?!?! I think it needs to be eaten completely unadorned. It's worth researching on your own, but there is a lot of current science that says that suckering is an outdated and will reduce your yield. If I see evidence (frass) of a tomato worm and can't find it I mist the plant...they usually wiggle a bit when they get wet and then you've got them! We can't trim suckers either...we need the leave to protect from sunburn. Cherry tomatoes are meant to be eaten in the garden with a basil leaf wrapped around them...yum!